Hello everyone! It has been a quiet month here on the interwebs, a month busy with ground prep, planting, thinning and weeding. Today marks the start of another CSA season!! And so, it seems like a good time to catch up with one another, to take stock of the happenings on the farm so far this spring and those still a-happening! We went into this spring feeling like we had made three decisions that would ease some of the problems that the last two long, cool, and wet springs had given us. We purchased a tractor (finally! ), we built a field hoophouse (finally! ), and decided to rearrange the length of the CSA to by-pass spring, encouraging CSA members to drop by market and shop during the late winter and spring with their CSA discount instead of offering shares during the seasons when harvests are less predictable. Most significantly, we didn’t want to feel pushed to harvest things before they were fully mature to fill shares in the spring, thereby lessening our overall yields for the season. And we have been happy with all of these decisions, immensely! We just can’t help but chuckle at the never ending surprises of each season and realize, for the millionth time, that we won’t ever be fully in control of this ship! By far the biggest contender we have towards predictability on the farm is, of course, the weather. This spring has been all over the map. The truth is that it was extremely wet, cold, and even snowy in March! We had to wait longer than usual to get into our fields. And even though the last two years we were able to work some soil early, we then had to wait for so long for things to grow well in the cool and wet weather. This year, since it has dried out, it has been actually, beautifully warm! We have been swimming already…in May! We have worked sleeveless and in sandals and the sun has felt so good! But even this brings with it complexity. Last year, despite the delay in harvest of heat loving crops, the overwintered crops like rapini and purple sprouting broccoli lasted into June because of the cool weather, leaving us with some overlap in the seasons. This year, those crops have burst into flower, unstoppable, in response to the warmth. Certain crops that got a late start aren’t yet harvest-able, and certain crops that would normally thrive in the spring aren’t producing well…our first round of radishes got soft in the center because they matured right during a particularly warm week. And so, we laugh, to think we had taken steps to have it all under control. Still, awesome things are happening this year too. Because we had the tractor, we were able to work up so much more space than we have in the past. Time has always been one of the factors limiting our growing space, as it took so many man hours for the farmer to prepare space with our little rototiller. We have planted out our propagation greenhouse twice, which for us is a win! We usually, again, run out of time and space for all of our starts, so this is exciting. And the starts were beautiful this year! The farmer created a d-i-y heated space for germinating seeds and growing our warm weather crops that involved christmas lights and plastic (instead of heat maps designed for this purpose but remain out of our tight investment budget); it worked wonderfully! The main space we have planted this year is our lower field, bottom land with great, fluffy, healthy soil! The crops that are on their way are growing daily in an even, consistent manner…we love to walk down there every morning to see the growth and the beautiful cell structure of these healthy plants, it certainly puts a smile on our faces. And even though we couldn’t have foreseen this, not starting the CSA six weeks ago was literally a lifesaver! Because of the weather this year, for the first time since we started harvesting for market year round, we had a gap in things to harvest. We took the middle weeks of May off because we literally had nothing to bring to market. The stress of that would have been terrible had the CSA been in full swing since April as it was last year (although to be honest, had we planned on CSA harvests during that time we would have managed our winter harvests accordingly). In the end, all the decisions we made for 2012 in response to 2011 and previous years have been good ones and just like with any other year, we will also face new challenges and respond to them as they come and in our planning for next year. We look forward to the harvests to come, and are happy to taste that which is ready now: the first lettuces of the year, those first mouth watering strawberries! Green garlic and green onions to replace stored onions in our skillet, a fourth child discovering the joy of spring peas! 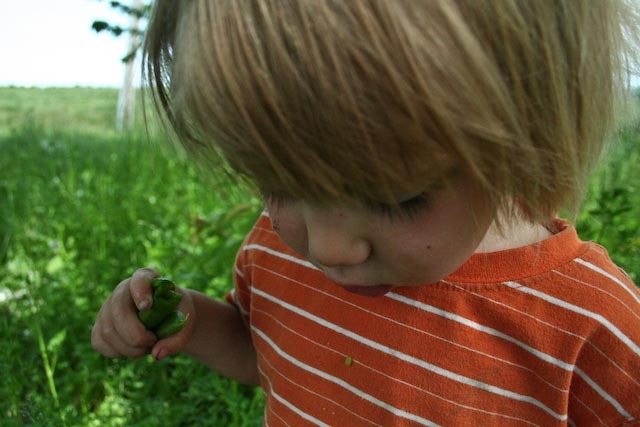 The kids can go outside now and pick a snack from the garden again and we all all are ready to stretch and grow a little in the sun after digging in our roots in a little deeper through the quiet of winter.